Are your customers slow about paying their invoices? 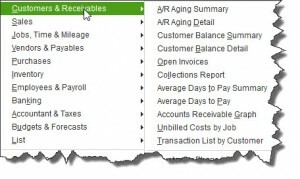 QuickBooks can help accelerate your receivables. Your company’s cash flow depends largely on how quickly your customers pay the invoices you’ve sent. And if you’re like most small businesses, those checks tend to dribble in close to—and after—the due date. If you operate on a slim margin, this often means that you’re late at paying your own bills. It’s essential, then, that you do what you can to get incoming revenue moving as quickly as possible. QuickBooks offers numerous ways to help you accomplish that critical goal. The single most effective step you can take to speed up customer remittances is to allow payment by credit card or electronic check. If you’re currently only accepting paper checks, you already know what problems that option can create, like mailing time, trips to the bank, and insufficient funds. To establish this capability, you’ll have to sign up for a merchant account that will connect your bank to the financial institutions used by your customers. There are fees associated with this, and the initial setup will be unfamiliar to you. We can help with this. Once you sign up for a merchant account, you’ll be able to accept payments from customers by credit card and bank transfer. Your customers will appreciate the convenience, and may even be more likely to make a purchase. In 2018, customers and prospects expect to be able to pay for items and services electronically. Not allowing this affects their perception of you as a forward-thinking, progressive business. You’ll save time, which translates to money. Instead of chasing payments, you can be working on ways to meet your goals and help your company grow. If you’re conscientious about keeping your records and transactions updated, you’ll always have access to the most current data about your company’s financial status. You’ll be able to answer questions from customers and vendors quickly and accurately, and your daily accounting tasks will be much easier to accomplish. There’s another benefit, though: reports. One of the five best things about QuickBooks is its ability to create dozens of reports using pre-formatted templates. You only have to choose the one you want to see, and the software will display it using your company’s data. You also have the option to customize these reports extensively, so they contain the exact cross section of data that you want to see. QuickBooks contains dozens of templates for pre-formatted reports that you can customize and create very quickly. You can see in the image above that several of QuickBooks’ reports are focused specifically on the status of your customers’ invoices and payments. We strongly recommend that you run these reports regularly. The more you know about who is behind and by how much, the more targeted your collections efforts will be. You’ll also notice that there’s a category of reports called Accountant and Taxes. You can certainly create these yourself, but some, like Trial Balance, will be unfamiliar to you. There are others listed under Company & Financial that are quite complex, but quite important. We’d be happy to analyze these for you on a regular basis (monthly or quarterly) and provide insight that will help you make better business decisions. There are all kinds of reasons why customers pay invoices late. Their bills may have been lost in the mail. They may have ordered so much that they’re confused about which invoices haven’t been paid. And they may just be low on funds. You can’t do much about the latter reason, but QuickBooks provides a way for you to update customers about their past due payments: statements. Sometimes, customers just need a full accounting of what they owe in the form of a statement. It’s not difficult to follow QuickBooks’ customization options for statements, but we’re here to help if you run into difficulties. In fact, we’d be happy to sit down with you and talk about these as well as other options for improving your company’s cash flow. It’s a multi-faceted problem with many solutions; we can go over the options with you. Contact us now to work on making the rest of 2018 more profitable. Is your business experiencing cash flow problems? QuickBooks offers many ways to help improve this. Give us a call to discuss. Don’t yet have a merchant account? Your business needs to be able to accept credit cards and bank transfers. Let us help. Are you making good use of all the report templates QuickBooks offers? Many can help you track outstanding receivables and we can show you how. Not sending out QuickBooks statements? They can be an effective way to collect on past-due invoices. Talk to us about it.